While we were growing up my Dad was always the one who cooked most of the meals for us. He was the type of cook who would throw things together, and they’d always come out perfectly, despite the fact that my Dad has a million food allergies, and had not tasted some of the ingredients he was using in years. As my dietary needs changed, Dad has seamlessly adjusted the meals he’d prepares when we come to visit. One dish that he has started making is a vegan mushroom and spinach risotto. I love it. But I never made it for myself, because anytime I would start, I would remember watching him stirring and stirring and stirring the risotto for what seemed like decades [to my overly hungry mind]. I decided I would just leave the risotto-making to him. And then I read an article about cooking Risotto in the rice cooker. And I thought hey…I could do that! So I decided to convert the recipe my Dad used for Risotto into an easier, rice cooker version. I’m incredibly fond of my rice cooker. It is a Zojiruishi brand. The model I have isn’t in production anymore, but this one is similar. I originally had one of their more simple models – without a computer chip, like this one. But, I found the model I have now on a steal – deal on Ebay, and jumped on it. While I usually don’t like having a specialized kitchen appliance – this one (and the bread maker) take the cake as the most useful devices in my kitchen. Seriously. I actually love everything Zojiruishi makes – I have their rice cooker, bread maker, and bento thermos, and all function amazingly. But – this post is about risotto, not my love for the Japanese’s way of making appliances. The stars of this Risotto show are the arboria rice, the nutritional yeast, and the lemon juice. Arboria rice is a special kind of short grain rice. It’s known for being firm and creamy. It also blends well with just about any flavor you throw at it. I especially enjoy it for it’s creamy consistency – since a dairy-free-world is often a creamy-consistency-free-world. This type of rice should be available at most grocery stores – although the store I frequent didn’t carry it. Any other type of rice won’t make ‘risotto’ in this recipe. 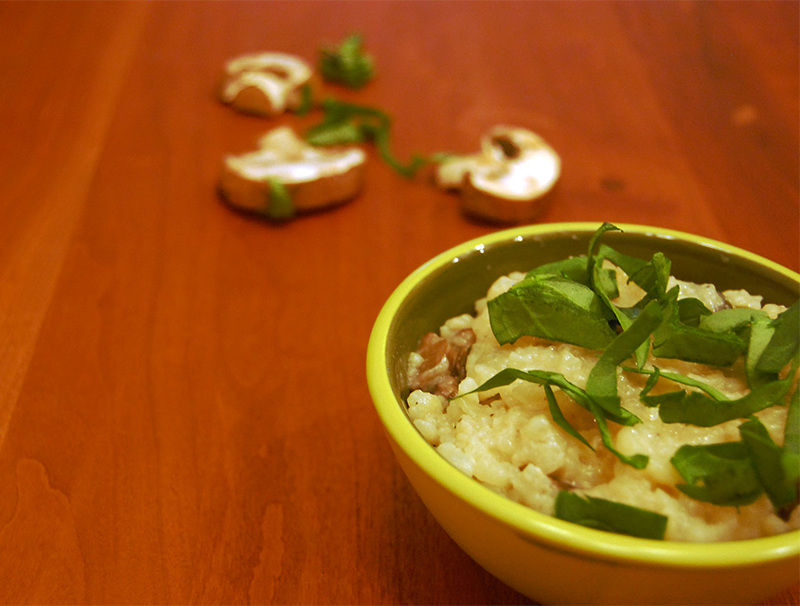 Nutritional yeast gives the risotto a touch of a cheesy flavor. Now, if you’ve never had nutritional yeast before, know that it’s an acquired taste for most. I didn’t like it at all the first time I ate it. Now, I think it melds flavors nicely. The lemon juice, stirred in at the end of this recipe, gives the risotto a nice tang. All in all the flavors blend together for a creamy, delightful dish. While I enjoy eating risotto as a meal on it’s own, most people would probably enjoy it as a side dish, or with a nice big salad. Me? A side item? More like the only item.. Can I eat it out of the serving bowl? Add the rice, stir well. Add the vegetable broth, wine, salt, thyme and mushrooms. Close the lid and turn to “sealed”. Click 'Manual' and reduce the time to 5 minutes. Once cooking is done, use the quick release and carefully open the lid. Stir in the spinach, nutritional yeast, black pepper and vegan butter. Stir very well. If it's still liquidy, let it sit for a couple of minutes, it will thicken as it cools. I included this recipe in Ricki’s recipe roundup. Click here to check out other great recipes! Fast and so delicious! I use Redmond 4500 multicooker for risotto and other recipes – for me it’s much better way of cooking. Multicooker is much faster and simpler. What is more – after work or school multicooker gets for me usual and tasty dinner! Glad you enjoyed it! I’ve never heard of that cooker before…the Instant Pot is awesome for my needs! Love this!!!! I made this in the instant pot and it came out beautifully. Thank you for sharing your recipe!! 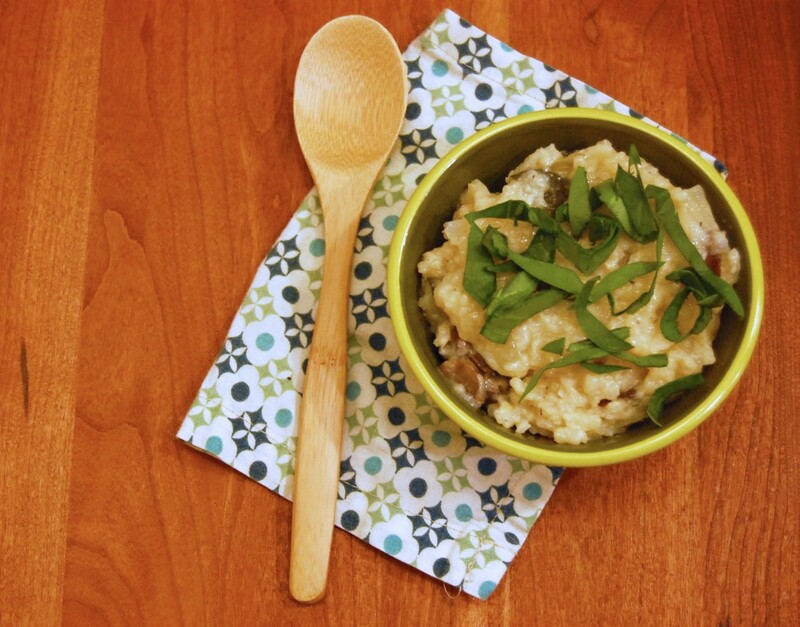 This cooking method only works for the Arborio rice! If you wanted to make a similar dish you could cook brown rice at a ratio of 3/4 cup water to 1/2 cup rice (scaling up at the same ratio if necessary) on manual at 22 minutes (cooking time remains the same as you scale) (for the instant pot) (or on the brown rice setting for the rice maker). You could add the other ingredients in before cooking, or at the end – since I haven’t tried it, I’m not sure which would be better! Sorry I could not be of more help! Where does the lemon juice go in the instant pot recipe? You add it at the end when you stir in the spinach! This was awesome! First dish I cooked in my shiny new Instant Pot. Fed it to gluten free and vegan family members and met with rave reviews. Thanks for sharing it! Waho!!! I am so glad you liked it!!!! Hi, are there any special suggestions for doubling the recipe? Just double everything? Doubling everything will work just fine!! Simply make sure it’s not going to overflow your cooker! Man, o, man! Just tried this out….amazing! Made mine in the instant pot, soooo easy. Thank you! Awesome!!! I am so glad you enjoyed it!!!!! This looks really delicious. I will try to make this for my family. Thank you so much for sharing this ! Great! I’d love to hear what you think when you do make it! We made this tonight to test out our new instant pot and it’s just WOW! So delicious!! Saving it to make frequently! Thank you! It’s soooooooo cheesyyyyyy!!! My son and I love it!! Yay!!!! I am so glad you like it! I’ll have to try this one again. The instant pot instructions didn’t mention the lemon juice so I added it with the broth and wine. ehhhh I think next time, I’ll add just a little at the end but not as much as the recipe calls for. It’s otherwise very nice. I’m glad you enjoyed it! I really like the lemon flavor – but you can do it to taste! Ok, we made this again tonight. I had kale in the fridge so we chopped and sautéed that, adding it at the end with some lemon juice. So good! Thanks for such a delicious recipe! Made this tonight – my family loved it, especially my 3 boys! Look forward to trying more of your recipes. Is this possible with red wine? My partner said he loves his mushroom risotto with red but I’m skeptical to use it because it seems like it might contrast with the other ingredients listed. Hmm. I am not sure I personally would go with that 🙂 I’d love to hear how it turns out if you try it! Wow – I have just made this in my shiny new Instant Pot (it arrived today!) and it’s is amazing. 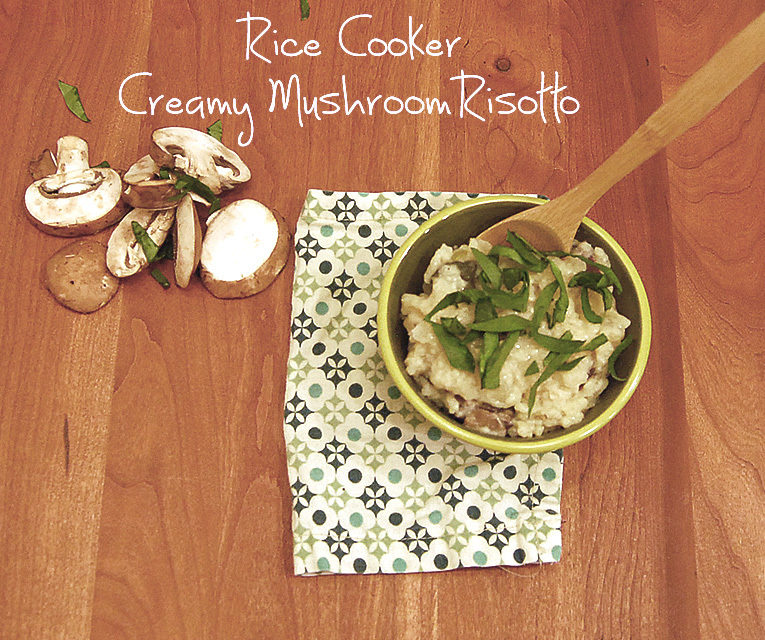 I am so impressed – it’s dreamy creamy with perfectly cooked rice, so simple to do and so darn tasty. I have a friend coming for dinner any moment now and I can’t wait for her to get here so we can eat it – yummy!! Thanks so much!! Yay!! I am so glad you liked it! Hmm. It may be too small! I think mine is a 3 cup 🙂 You could do it on the pot in the stove – more like a traditional risotto. You need to stir it a lot, though! Thank you! This was amazing.